Pinion, Minnesota: a metropolis of all of seven hundred souls, for which the word "moribund" might have been invented. Nothing ever happened there and nothing ever would--until the mayor of sorts (campaign slogan: "I'll Do What I Can") and a buddy come up with a scheme to put Pinion on the map. They'd heard of a place where a floating image of the Virgin Mary had turned the whole town into a shrine, attracting thousands of pilgrims. And all those pilgrims needed food, shelter, all kinds of crazy things, right? They'd all get rich! What could go wrong? When the dead body shows up, they find out, and that's only the beginning of their troubles--and Virgil Flowers'--as they are all about to discover all too soon. 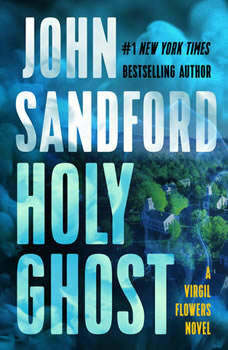 American author, John Sanford (a pseudonym of John Roswell Camp) wrote thirty-five novels, all of which are on the New York Times bestsellers list in one way or another. He was born in Cedar Rapids, Iowa in 1944, where he spent much of his time with his Lithuanian grandparents. Their home was very primitive with an outside outhouse and a subsistence garden. Life was work centered on the farm with hay being bailed each summer to feed the various farm animals. Fruit trees were also in abundance on their property. It was a good place to grow up. Camp won the Pulitzer Prize in journalism, and also won the Distinguished Writing Award of the American Society of Newspaper Editors. He also wrote two non-fiction books. The Eye and the Heart: The Water Colors of John Stuart Ingle, and Plastic Surgery: The Kindest Cut. Camp was married to Susan Lee Jones, and has two children. Susan died in May 2007 of metastasized breast cancer, and he married again in 2013 to Michele Cook, a journalist and screenwriter. Camp is a dedicated painter and photographer also. He, however, does not show his paintings. Camp's most prolific work is the Prey series of which there are currently twenty-five installments, running from 1989 - 2015.......the first being Rules of Prey and the most recent, Gathering Prey, which debuted on April 28, 2015. Other series include The Kidd Series, The Virgil Flowers Series, The Singular Menace Series, and other various books and short stories.